i am so excited for this giveaway and the message it is promoting is near and dear to my heart in a lot of ways. while i was buckling stella back into her rear facing toddler seat after dropping rowan off the other day, i looked over and saw a couple of stickers on a minivan that got me all giddy - one said, 'my toddler rides rear facing, ask me why' and another one about cloth diapering. this was it, an opening to get to know another bethlehem preschool mom. we chatted for a bit about how much alike we were and our passion for extended rear facing then she willingly handed over the name of the online shop where she had purchased the decals. as soon as i got home i looked up educated mama decals hyena cart shop and got all excited - this is when i knew i had to get in contact with this gal and get her name out there. i was sure many of my erf passionate social networking friends would love to know about her product! laura was equally excited and sent me out a decal to try right away. 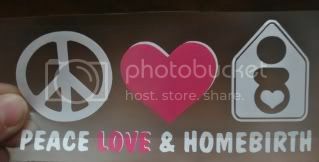 the communication has been absolutely wonderful and my decal arrived super speedy with easy to follow instructions. i got it up super quickly one morning before preschool and it has already drawn in attention and questions - exactly what it was meant to do! mine says, 'my child isn't a minimum, we ride to the max. proudly extended rear facing, ask me why.' i am already planning to order a cloth diaper one - i am a proud supporter of saving the planet one less disposable at a time and am not afraid to tell the world about it via my mini van, ha! but don't stop there! she has stickers about home birth, breastfeeding, baby wearing, vegan choices, vaccines, home school and more. i just want to throw out there though, that these opinions are all my own and i in no way judge anyone who makes different choices for their children. only you can be the judge of what is right for your family and it just so happens that my husband and i feel these are the right decisions for us. love you guys - xoxo! before we get to the giveaway i want you guys to check out some information, it might change the way you view or feel about rear facing. let's start with this video (thanks to shawntae from a little king and i for the idea to go searching for these), it was the kicker for me - i knew just reading about extended rear facing that it felt like the right choice but seeing it puts it all into perspective. click here for video. Rear-facing is safest for both adults and children, but especially for babies, who would face a greater risk of spinal cord injury in a front-facing carseat during a frontal crash. Rear-facing car seats spread frontal crash forces over the whole area of a child's back, head and neck; they also prevent the head from snapping relative to the body in a frontal crash. Rear-facing carseats are NOT a safety risk just because a child's legs are bent at the knees or because they can touch/kick the vehicle seat. Rear-facing as long as possible is the recommendation of the American Academy of Pediatricians, and can reduce injuries and deaths. Motor vehicle crashes are the #1 overall cause of death for children 14 and under. 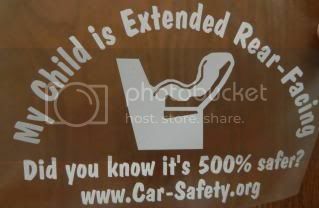 information via http://www.car-safety.org/rearface.html, feel free to read more! so, the giveaway! laura and i have teamed up to giveaway a $7 credit to her shop, which can get you just about any decal in her store and while i instantly fell in love with the erf sticker you might have your eye on a homebirth or babywearing one - sky's the limit! 2. 'like' educated mama decals on facebook. this giveaway will run until november 18th at 10pm pst - good luck! Oh my gosh! I love the cloth diapering one, and the rear-facing. I can't say I'll be doing a home birth anytime soon, but I fully support (and understand) those that do! What a great company. I love them all! I feel like such a crunchy hippie for wanting to put 'em all on my car... but I really like the quiver of arrows, and the breastfeeding twins stickers! Ooooh! This is great - such a neat way to advocate for ERF and other great child focused philosophies! I like Educated Mama Decals on FB. Created a Twitter account, tweeted! I would LOVE to have the "My child isn't a Minimum" ERF sticker!